Spinach, eggs, tomatoes, skillets and spatulas are not typically in a health professional’s toolkit. But for some UCLA students, they eventually might be. 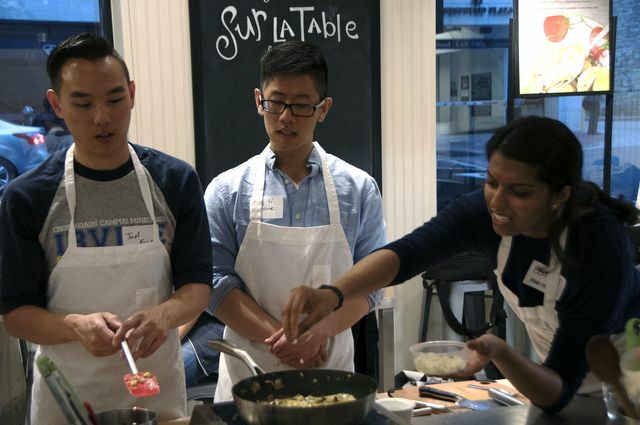 At UCLA Health Sciences, students are learning about nutrition and food preparation in what might seem an unlikely place — not a classroom but rather a kitchen in a store better known for high-end kitchenware: Sur La Table. 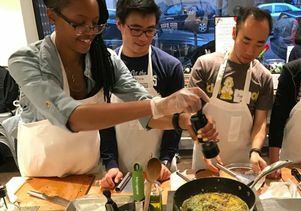 The store is playing host to a so-called “teaching kitchen,” as part of a pilot program that teaches healthy eating and cooking skills to students in the David Geffen School of Medicine at UCLA, Fielding School of Public Health, the dental school and the nursing school. Taught by two UCLA dietitians and a chef, the class has already taught one cohort; now it’s gearing up for another — the second of what organizers hope will become a more formal part of the curriculum. The fact that the students also learn about related disciplines is a bonus. Too often, doctors, dentists, nurses and public health workers tell people to “eat a healthy diet,” without knowing how to explain the admonition in a practical way, much less how to put it into practice, Braddock said. This is especially true for students, who may also lack the life experience of shopping for, and preparing, healthy meals. Let’s face it: They’ve been surviving on take-out food and ramen noodles for years. This general lack of knowledge can create a disconnect between patients and doctors, nurses, public health workers and dentists. In effect, it’s a missed opportunity to keep, or make, people healthy. That needs to change, health educators agree, especially with evidence stacking up about the importance of a varied, plant-based diet. Across the nation, medical schools are emphasizing the importance of teaching their students about nutrition and the impact that can have on health and disease risk. Often, they’re starting with the basics: How to cook simple, nutritious recipes. Janet Leader, associate director of nutrition programs in the community health sciences department in the Fielding School of Public Health, is the mastermind behind UCLA’s Teaching Kitchen Collaborative, which is supported by UCLA’s Healthy Campus Initiative. She — along with medical student Stephanie Gall and Kaitlin Reid, a health educator and dietitian with the UCLA Arthur Ashe Student Health and Wellness Center — developed the pilot classes. “This class was designed to teach students — in a very practical, hands-on way — not just how to cook healthy and eat healthy, but also how to share that with patients,” Leader said. Across the health sciences, students jumped at the opportunity. More than 430 students from across the four schools applied for the first course. Because Sur La Table’s space was limited to only 16 students per class, only a fraction of the students were able to participate. The demand was so great that some students had to share an opening; some students took all three classes, but others took a turn with two fellow students so that each took one class. “Even our preliminary data show that those students who took all three classes had much higher improvement in knowledge and confidence than those who took one class, but even one class can make a difference,” Leader said. Pre- and post-class surveys showed that the class increased student knowledge of the topics, while giving them the confidence to share what they had learned, Leader said. Leader and others hope to expand the program beyond the pilot study. “Everyone should know more about nutrition,” she said. Brian Cesson - Dentistry student Joel Fong, medical student Billy Nguyen and public health student Eesha Jagtap apply their own finishing touches. Billy Nguyen, a second-year medical student considering a field in neuro-oncology, said he saw the class as a way to finally make the abstract “healthy eating” advice more tangible. Rebekah Israel Cross, a second-year doctoral student in the Fielding School, attended the class focused on how to prepare healthy take-with-you lunches, such as soup, hummus and salad. Time-saving techniques for vegetable-laden dishes, how to poach an egg, how to make healthy ramen — Nguyen and his classmates learned them all. Now they’re better prepared to teach patients. The next Teaching Kitchen Collaborative begins Oct. 16, with plans for another class in the winter. Organizers will turn to their waiting list to fill the class but, with additional funding, would invite new students to a class in winter quarter.